The social nature of the ONCE imbues and conditions the ultimate purpose of this association of the blind, which is to achieve two main objectives: the self-reliance and full social integration of its members. The specialized social services are the institution’s hallmark. The ONCE earmarks over 230 million euros a year (2009 figure) to social activities. The ONCE service model is unique in the world. It includes every specialized aspect and/or service that a blind or visually impaired person might need: education, employment, rehabilitation, adapted technical aids, communication and access to information, sports, leisure, etc. The ONCE’s ability to provide specialized services to its blind members is the fruit of the supportive investments made by thousands of our fellow citizens every day through the purchase of the organization’s gaming products. The ultimate goal of the social services provided by the ONCE is to have the blind and/or visually impaired attain full self-reliance. The specialization of these services is key to achieving results. The Organization’s professionals play a notable role in the rehabilitation activities that encompass all aspects of life for an ONCE member. Achieving adequate mobility and maximizing one’s remaining visual abilities are some of the goals that can be realized given enough time and patience. The results are guaranteed by the quality of the personalized care. Whether it’s using a cane to get around or opting for a guide dog to enhance autonomy, these choices both require proper training. The ONCE supports an inclusive educational model for child members, boys and girls studying in schools in Spain. Ninety-eight percent of them, or nearly 7,500 visually-impaired students, are getting a normal education in ordinary schools all around the country. These young members also have almost 500 dedicated ONCE professionals at their disposal to help them with their learning and to provide them with the material they need to take part in classroom activities. We also help their teachers, classmates and families so that everyone can be involved in the learning process. Specialized learning for children with visual disabilities is provided in five ONCE centers, located in Madrid, Barcelona, Pontevedra, Seville and Alicante. These are the so-called Educational Resource Centers (CRE in Spanish) where non-structured instruction courses are given, depending on labor market demands, and/or specialized skills are taught to deaf and blind children. Courses in Braille, using adapted computer equipment, study techniques, orientation and mobility, social skills and the like are some of the specific subjects that are taught to students with visual disabilities. The disability that combines two sensory deficiencies, visual and auditory, is known as deafblindness. The special needs and the communications problems resulting from this disability depend on the extent or seriousness of the condition in the individual. Those ONCE members who exhibit an auditory deficiency are referred to as “members with deafblindness”. So as to assist those members and at the behest of the ONCE, the ONCE Foundation for the Care of Persons with Deafblindness (FOAPS in Spanish) was created in 2007. Career development is not only indispensable; for people with disabilities, it provides a way to integrate with society, an goal littered with obstacles in which proper training is essential. Hence the ONCE’s dual purpose: to highlight the importance of training and to obtain commitments from social agencies involved in the business world. The main source of jobs for the visually impaired is the sale of the Cupón and other games of chance sold by the ONCE. There are many other blind professionals, however, who are perfectly capable of doing other jobs: lawyers, economists, interpreters, musicians, psychologists, reporters, teachers, IT specialists… all of them looking for a chance to prove their worth. The ONCE provides Career Training by organizing and teaching specific courses on topics such as Telephony and Telemarketing, Computerized Stenography, Computer Network Management, etc. It also offers financial aid and grants for the courses, the training and to recycle and adapt computer equipment. The ONCE also has a University School of Physiotherapy , a center attached to the Autonomous University of Madrid and which produces dozens of physiotherapy specialists each year. People with visual disabilities excel in this profession both as public and private care providers and have attained a level of prestige that is acknowledged by everyone in the field. Hundreds of professionals are working in fields as diverse as teaching, healthcare, communications, law, music and administration. In addition, the ONCE, as a social agent that provides employment, has created 16,000 new jobs and engaged in 32,000 training activities for people with disabilities between 2004 and 2011, all as part of a commitment made to the central government. The UN Convention on the Rights of Persons with Disabilities recognizes the importance of access to culture “so that people with disabilities can fully enjoy all human rights and fundamental freedoms”. In keeping with this tenet, the ONCE offers a series of resources that enable the blind to enjoy the entire range of offerings that make up the cultural landscape: theater, music, arts, audiovisual recordings, literature, etc. Bibliographic production. A specialized service with two centers, one in Madrid and another in Barcelona, that prints works in Braille and ink as well as sound and digital editions of literary or specialized texts, depending on the interest in the work and on the demand from ONCE members, who can request whatever books they want or need at any time. The catalogue of available works and their availability on different media can be checked through a computerized database.A series of agreements with universities and publishers also allows Spanish blind persons to access their collections in digital format. Literary creativity is stimulated by way of contests, such as the TIFLOS Award for novels, stories and poetry, a now seasoned competition held annually by the ONCE. There is also the Roc Boronat Literary Contest for Catalan literature, and the Prometeo Awards, intended exclusively for blind children. The Tiflos Award also boasts a Journalism prize to acknowledge the work that best captures the essence of news reporting and which promotes the social integration of persons with disabilities. Audio-description. So as to allow blind persons to enjoy theater and movie presentations to their fullest, the ONCE offers a system called audio-description, which provides audio information on visual details (changes in setting, gestures, wardrobe) by overlaying comments on a sound track and, in theaters, by relaying this information to a small receiver held by the individual blind spectator. This system has been in use at a movie theater in Madrid (Roxy B) since December 9, where new releases are regularly screened using this audio-description system. With a few simple adaptations, people of any age with visual impairments can participate in various sports. Swimming, athletics, tandem cycling, judo, ski, indoor football, mountain climbing, chess and goalball (created specifically for blind athletes) are just some of the sporting disciplines that have no barriers. Whether it’s calisthenics at school championships or high-level sports, ONCE members can find the sports activity that is perfect for them. The Organization also promotes and helps skilled high-level athletes. 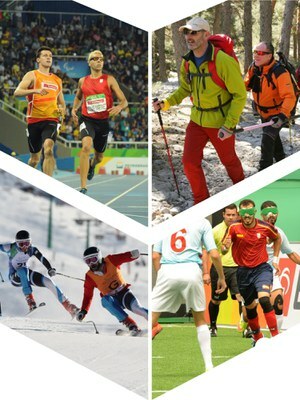 Every sporting discipline is grouped under the Spanish Federation of Sports for the BLIND (FEDC in Spanish), which was created in 1993. For a few years now each sport has also been associated with its respective federation, as is the case of tandem cycling, for example, which has a single national coach responsible for every variant of cycling for the disabled under the umbrella of the Spanish Cycling Federation. This is just one more step toward the normalization of those sports that are played by people with disabilities. The disciplines overseen by the FEDC are: chess, athletics, tandem cycling, skiing, indoor football, goalball (created specifically for the visually impaired), judo, mountaineering, swimming and shooting. On a related topic, the Paralympic Games are a fine example of the excellent skills possessed by visually disabled athletes, as was confirmed at the last games held in Beijing in 2008. The ONCE also chairs the presidency of the Spanish Paralympic Committee, whose role was given a boost following the implementation of the government’s ADOP Plan (Support Paralympic Sports), which is helping elite athletes with disabilities to prepare for the 2012 London Paralympic Games.